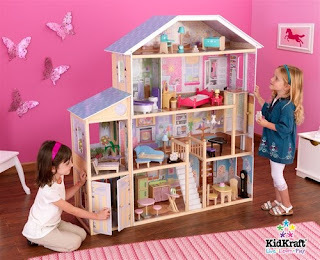 Over four feet wide and four-and-a-half feet tall, this gorgeous dollhouse will give young girls tons of space for taking care of their favorite dolls. 51" x 14" x 52.75” H, 54 lbs. Just imagine the look on the face of that special little girl in your life when she opens this Christmas morning! Be sure to order in time as this is sure to be a hot item this holiday season.